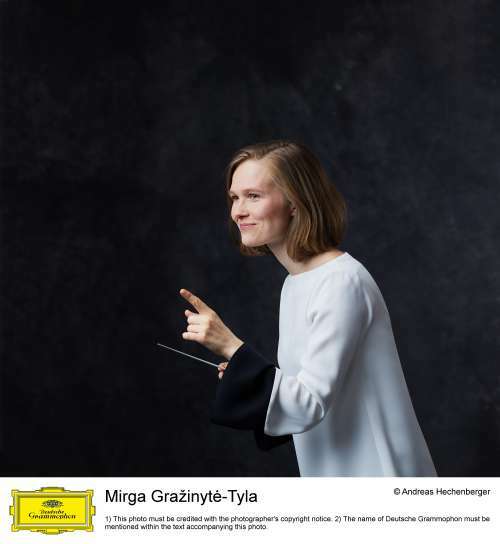 05 February 2019 (Toronto, ON) – Young maestro Mirga Gražinytė-Tyla makes history as she signs to Deutsche Grammophon – home to legendary conductors such as Herbert von Karajan, Claudio Abbado, Pierre Boulez and Andris Nelsons. The Lithuanian musician, who is Music Director of the City of Birmingham Symphony Orchestra, becomes the first female conductor to sign an exclusive long-term contract with the label. Gražinytė-Tyla will release her debut album in May – a collection of orchestral works by Polish composer Mieczysław Weinberg, whose centenary falls this year. She conducts the combined forces of the CBSO, Kremerata Baltica and violinist Gidon Kremer in Symphony No. 21 “Kaddish” – a major work completed in 1991 and dedicated to the victims of the Warsaw Ghetto. She also directs Kremerata Baltica in the early Symphony No. 2. Gražinytė-Tyla will go on to present music by her compatriot Raminta Šerkšnytė with the Lithuanian National Symphony Orchestra, Vilnius Municipal Choir and Kremerata Baltica, a project she will follow up with an album of works by British composers with the CBSO as the orchestra celebrates its centenary. Born in Vilnius, Mirga Gražinytė-Tyla is one of today’s most exciting young conductors. After early studies in choral conducting and the visual arts in her home city at the National M. K. Čiurlionis School of Art, she went on to study at the University of Music and Performing Arts in Graz, before completing her conducting studies in Bologna, Leipzig and Zurich. Her career breakthrough came in 2012 when she won the prestigious Salzburg Young Conductors Award. In 2013 she was appointed First Kapellmeister at Bern City Theatre, and from 2015 to 2017 was Music Director of the Salzburg Landestheater. In February 2016 she hit the headlines around the world after she was unanimously chosen to be the new Music Director of the City of Birmingham Symphony Orchestra – taking over the post formerly held by Sir Simon Rattle, Sakari Oramo and Andris Nelsons, just months after making her debut with the orchestra in July 2015. Their partnership has since flourished, with Gražinytė-Tyla praised for her charismatic artistry and innovative repertoire choices. A Gustavo Dudamel Fellow of the Los Angeles Philharmonic in the 2012-13 season, Gražinytė-Tyla has served as the orchestra’s Assistant Conductor for two seasons and, for the 2016-17 season, as its Associate Conductor. Gražinytė-Tyla’s signing to Deutsche Grammophon marks an important milestone in her career. Her first recording was made at Symphony Hall Birmingham during the CBSO’s critically-acclaimed Weinberg Weekend in November 2018, and the album was made with the generous support of the Adam Mickiewicz Institute. It will be released in May and promises to be an exciting debut from an artist who never ceases to inspire.